Founded in 2005 by Eight (8) well established youth football associations who joined together to form the new Central Mass Youth Football and Cheering Conference. The goal of CMYFCC was to create a terrific playing and cheering environment for our kids; appreciate the democratic nature, cost structure and volunteer orientation of the American Youth Football national organization. These goals in conjunction with AYF, which was founded in 1996 to promote the wholesome development of youth through their association with adult leaders in the sport of American football, and get away from the superficial structure of weight and age and move into the all inclusive grade based structure, still hold true to today. The eight founding youth football associations are: Ayer/Shirley, Clinton, Hudson, Leicester/Spencer, Lunenburg, Nashoba, Westford/Littleton and the Worcester Cowboys. Since the inception, additional associations have joined CMYFCC – Marlborough, Charlton/Dudley, Groton/Dunstable, Nipmuc, Tyngsboro, Maynard, Milford, Shrewsbury, Leominster, North Middlesex, Northborough/Southborough, Westborough, Millbury/Sutton, Oxford/Webster, Hopkinton/Ashland, Tantasqua and Chair City. Central Mass 8th Grade Conference All Stars bring it!! 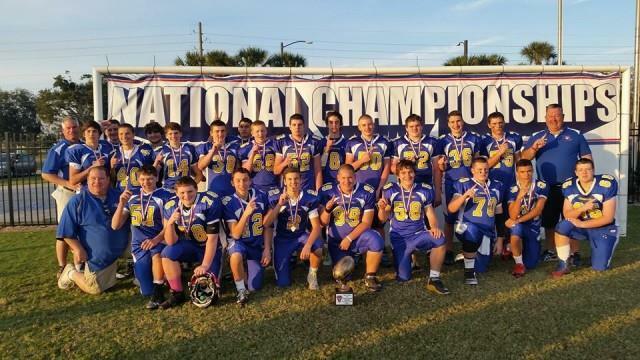 CMYFC 2014 - 8th Grade All Stars are National Champions! !